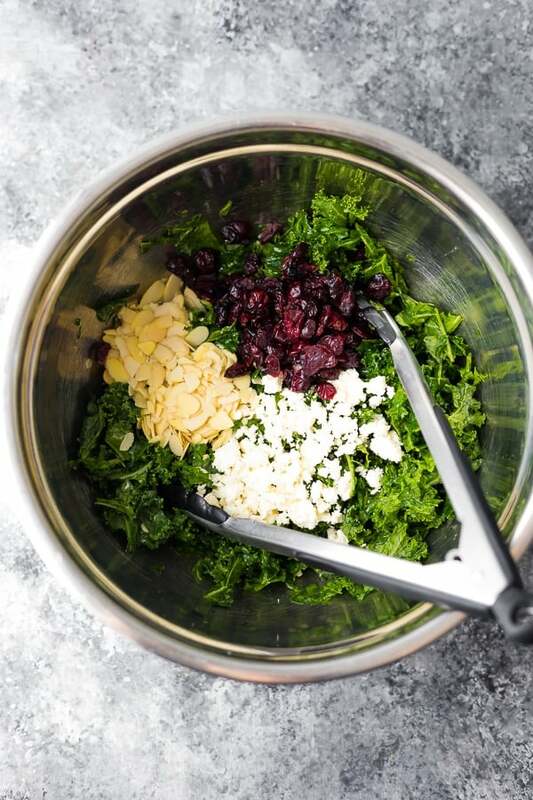 Our staple kale salad- with feta cheese, dried cranberries, sliced almonds and a tangy lemon vinaigrette, this simple massaged kale salad recipe is the one we always turn to in a pinch. You most likely fall in one of two camps: ‘ew, kale!’ or ‘gimme dat kale’. If you are camp ‘gimme dat kale’, you are going to love today’s recipe, our go-to staple kale salad. This is the salad that we make time and time again. 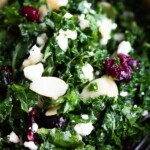 I turn to this massaged kale salad recipe when I have kale and don’t know what to do with it. I make this salad at Christmas, but also in the middle of summer. It’s perfect for so many different occasions, including just a regular weeknight dinner. 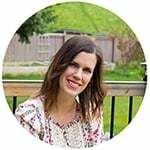 Let’s talk kale salad dressing! 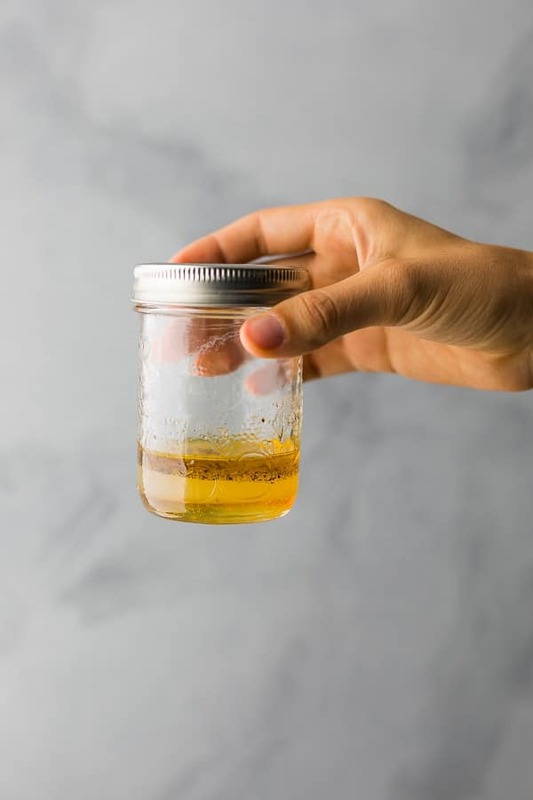 I used my favorite white wine vinaigrette and added just a touch of lemon juice. Lemon & kale go so well together! You could even add some lemon zest to really bring out the lemony flavors of this kale salad dressing. That’s it for this kale salad dressing…just shake it up and you are good to go! Raw kale on it’s own is not really that great, and can have a real bitter taste. 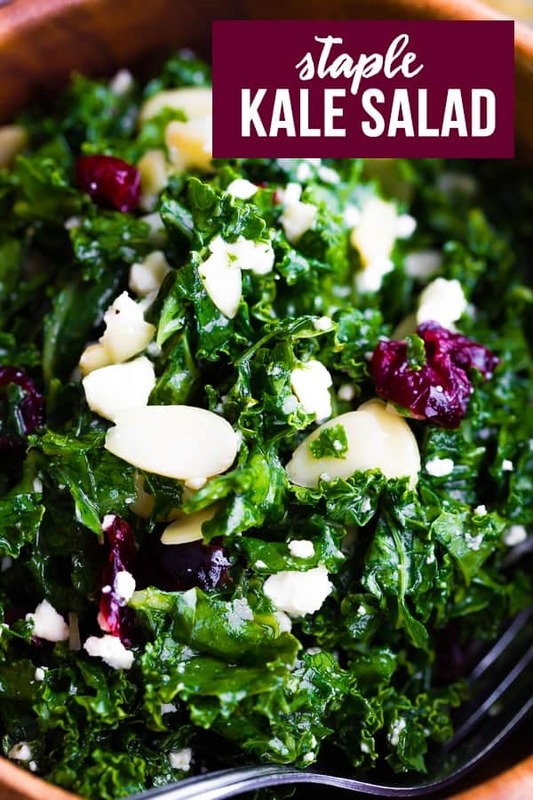 With this staple kale salad recipe, your kale is not going to be bitter! Massage your kale! This might sound strange, but softening the kale really takes the bitterness out of it. With clean hands, gently squeeze handfuls of kale. Keep doing this for 1-2 minutes, until your kale is soft and bright green. Dressing! Adding a tangy dressing like we use in this recipe to hide any remaining traces of bitterness. Goodies! Salad is not salad without all the ‘goodies’. 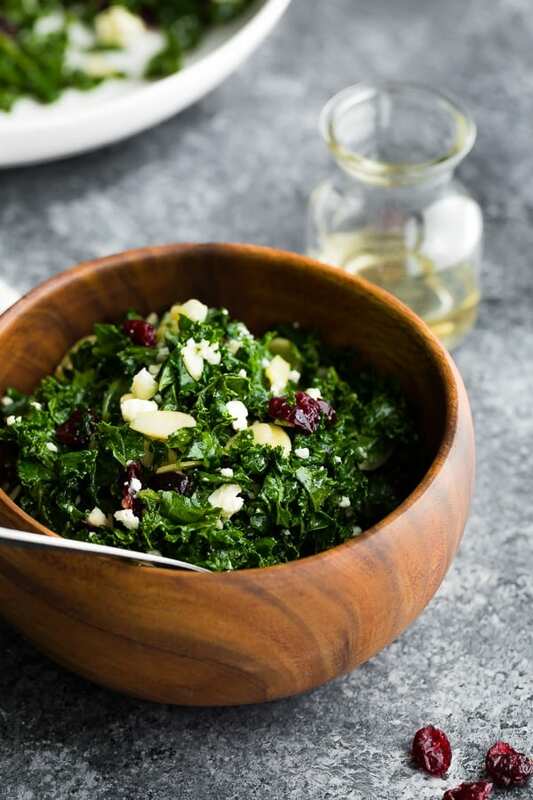 Salty feta, sweet dried cranberries and crunchy almonds totally compliment the kale in this recipe. or a large storage container). You can prepare the dressing 2-3 weeks ahead and store in the fridge. And you can keep leftovers of this salad for 1 day. It does get pretty soggy after that so I don’t recommend storing longer than 1 day. you can even swap the kale for romaine lettuce or spinach! Tear kale into bite-sized pieces (making sure to remove the thick part of the stem). Wash, then spin dry. 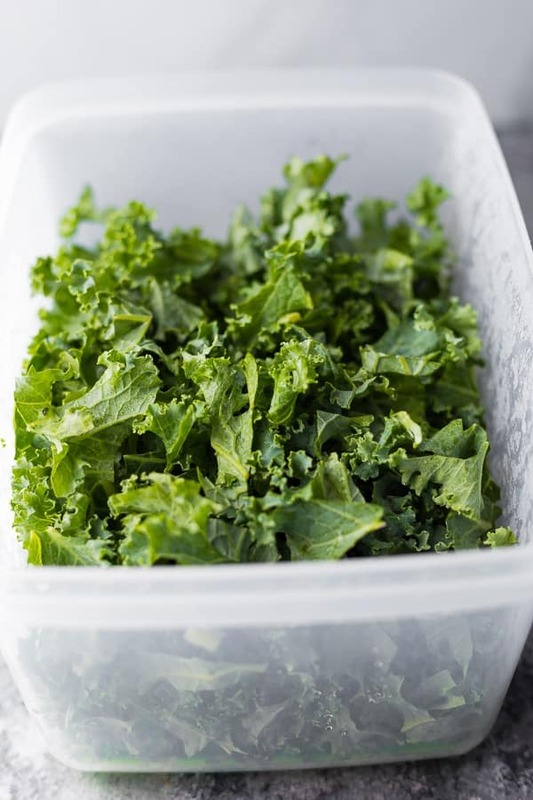 In a large bowl, massage the kale with clean hands for 1-2 minutes, until soft and bright green. Add the feta, cranberries and almonds. Shake together vinaigrette ingredients. Add to salad and toss. Serve immediately. 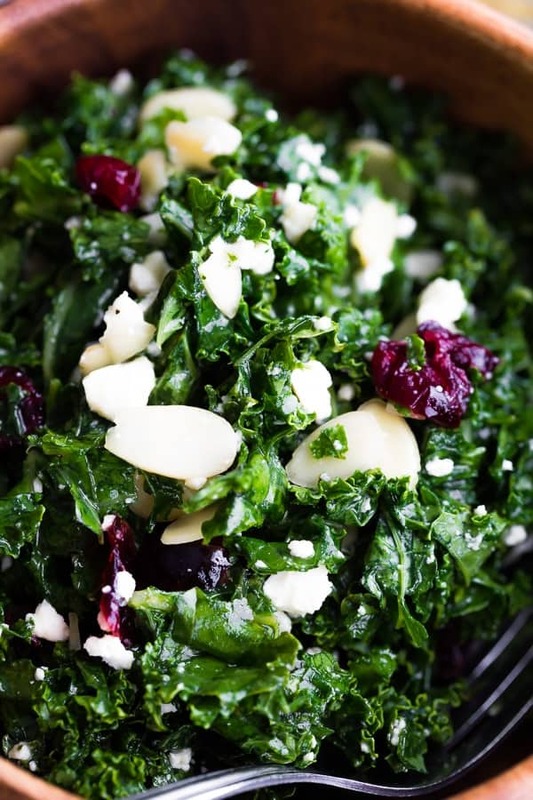 This kale salad can be made up to 1 day ahead and stored in the fridge. Almonds will soften so you may wish to add them fresh. You can prep your dressing and kale up to 1 week ahead for easy salad prep.